Tree-nation.com is a new community website, run by an international team, based in Barcelona, Spain. Together with people willing to participate like me and you, they will create a park by planting 8 million trees in the shape of a giant heart in the Saharan desert, to fight Poverty, Global Warming and Desertification. Using the latest in mapping technology, people all over the world can choose an exact spot to plant a tree on a virtual map, and a real tree will be planted in the same place in the real world. Soon each tree will be given a unique GPS code that you can use to locate and see your tree. The virtual trees all have profiles so you can wander around checking out other trees and seeing what’s inside. You can express yourself with the Tree-Blogs, contribute suggestions, share photos, make contacts and debate on environmental issues. Tree-nation will create its park in Niger, the poorest country in the world according to the Human Development Index (177/177 developing countries, 2006), and one of the most affected by desertification. The United States and Spain, both look good in green! According to the latest Ernst & Young Renewable Energy Country Attractiveness Index, the United States is the most attractive nation for those seeking to invest in renewable energy with Spain closely following behind. Out of a possible score of 100, the U.S scored a 71 in the “all renewables index” while Spain scored 68. The indices are broken down by different types of renewable energies which include solar, wind and bio-mass, but also include an index rating the renewable energy infrastructure of a particular country. Although Spain is still number one in terms of renewable energy infrastructure with a score of 78, the U.S. is not far behind with a score of 76. All in all, for us, what’s important to note is not the two or three point differential in the scores, but rather to understand that with the largest economy in the world taking renewable energy more and more seriously with each passing day, its relationship with Spain in this field is bound to grow. The report can be read by clicking here. Two linked pieces of news come from the Bay area that give a hint of what is to come: More developers integrating renewable energies in their housing developments and possibly finding a bank willing to finance them. New Resource Bank, San Francisco, has launched a program to offer financial incentives for green building projects. It will initially rely on design criteria established by the US Green Building Council. However, the bank is open to alternative approaches to demonstrate green design. Associated Content and the Mercury news report about a high-end all-solar housing community in the Bay area. It is only the first of four projects along the same lines by Lennar, one of the nation´s biggest home builders and SunPower, that provides the solar equipment. The houses will incorporate solar panels on the roof and an interactive digital electrical system which allows them to visually monitor their monthly power usage. Both companies are involved with the New Solar Homes Partnership, part of California’s Solar Initiative to install 400 megawatts of solar power in the next decade. To promote solar energy, the California Energy Commission offers incentives of $2.60 a watt for systems on new homes. Homeowners will receive a one-time 2,000 dollar federal tax credit for having this solar energy system installed in their homes. Whenever the homeowners create more power than what they use, the local utility, Pacific Gas & Electric company, will give them a credit in their bill that can be used when the solar panels are not creating energy, for instance, at night. Let´s just hope that things start moving downmarket fast, as with PC´s and laptops, because the price tag on these houses is still just a liiiittle steep for our middle class means (1.3 to 1.5 million bucks). The 2006 United Nations report on Human Development is titled “Beyond scarcity: Power, poverty and the global water crisis”. It does not leave much doubt on what it focuses on. Besides actual shortages of physical supply of water, the report argues that the roots of the crisis can be traced to inequality and flawed water management policies. And it is certainly true that freshwater scarcity is a worldwide issue. The World Health Organization (WHO) estimates that half the world’s population will face water shortages by 2025. In the United States, the Environmental Protection Agency (EPA), projects water shortages for 36 states by 2013. Given the transnational nature of the problem (water does not know of frontiers), there is clearly a scope for well-defined public policies and international cooperation. To give it a local perspective, we can look at the situation of the Great Lakes. In a recently published report , the International Joint Commission, a US-Canada organization to advise about the use and quality of boundary waters, gives that very same recommendation. 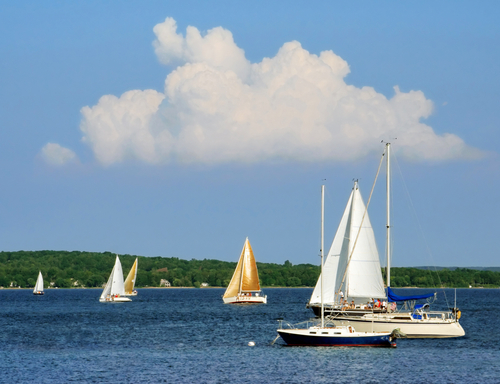 Accountability for protecting, restoring and maintaining Great Lakes water quality. This will require that the parties involved (that is, the US and Canada) work together to create the means – a framework – by which they can be held accountable for progress toward achieving this objective. And THAT IS indeed a jolly good objective, as the “Lakes of the Amerikey” are truly magnificent “inland seas” that many more generations should enjoy. Take note! An off-shore wind farm may be coming to a location near you! When people think of wind farms, they probably picture rolling green hills with large white wind towers majestically spinning against a baby-blue sky with a sprinkle of bright white fluffy clouds trailing in the distance. Yet, if Bluewater Wind, an energy company based in New Jersey, gets its wish, people will start picturing wind towers standing not on rolling green hills, but rather on the bedrocks of the blue ocean. Bluewater Wind proposes to build 200 wind towers off the coast of Delaware. The plan is to either build the towers either 12.5 miles off the coast of Rehoboth Beach or 7 miles off the coast of Bethany Beach so to provide electricity to the residents of Delaware. The proposed plan brings up the usual arguments for and against wind power. While wind towers produce no emissions associated with the greenhouse effect, they are, however, not completely reliable in that they cannot provide a stable pipeline of energy for 24 hours a day, 7 days a week. The solution to this problem, which came to my mind immediately, and which is cited in my article source, is to have wind power produce as much energy it is capable while having a reserve of provided by other sources of energy in case the wind towers aren’t able to meet demand. The proposed wind farm off the coast of Delaware could potentially produce 600 megawatts, but this won’t be something that happens every day. On average, the wind farm would probably produce 194 megawatts, enough for the daily needs of 125,000 homes in Delaware. Bluewater Wind aims to construct the off-shore wind farm by 2012, by then, it would be the second largest wind farm of its kind. Residents of the Chicagoland area have seen their electricity bills jump by 22% in the last months. I bet at least some of them might be starting to give a second thought to installing solar panels or solar water-heating collectors in their homes. Contrary to what one may believe, Chicago gets enough sun to make solar energy viable, even in winter. See this video from CBS2 Chicago for tips and more information. 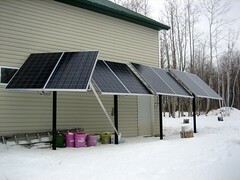 Solar PanelsOriginally uploaded by Canadian Veggie. Jeff Novich, Caitlin Costin and Mark O’Brien, Columbia University Graduate School of Journalism. This documentary gives a well explained account of the past and future issues concerning the grid. I must warn that it is pretty long (23 minutes). The fast pace of change in the wind energy market means that 2004, when it came out, is a looong time ago, but I think it is still worth it to watch it, as it is very informative of how we got to where we are and what is at stake. Topics covered: the history of electricity, the 2003 blackout, large wind farms in the northeast, especially New York, and wind energy’s economic impact on farmers and rural communities. You are currently browsing the Technology For Life weblog archives for February 2007.